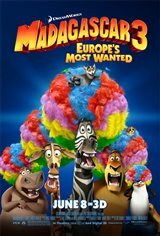 New York Zoo escapees Alex the Lion, Marty the Zebra, Melman the Giraffe and Gloria the Hippopotamus decide to go on a quest to return home in a scheme dreamed up by their crafty penguin and chimpanzee friends. Unfortunately, the plan doesn't go quite as anticipated when they find themselves stranded in Monte Carlo. In order to escape a tenacious animal control captain, the group catches a ride with a rundown travelling circus. When they find out the circus is headed for America, they come up with an act so they can pose as part of the show.